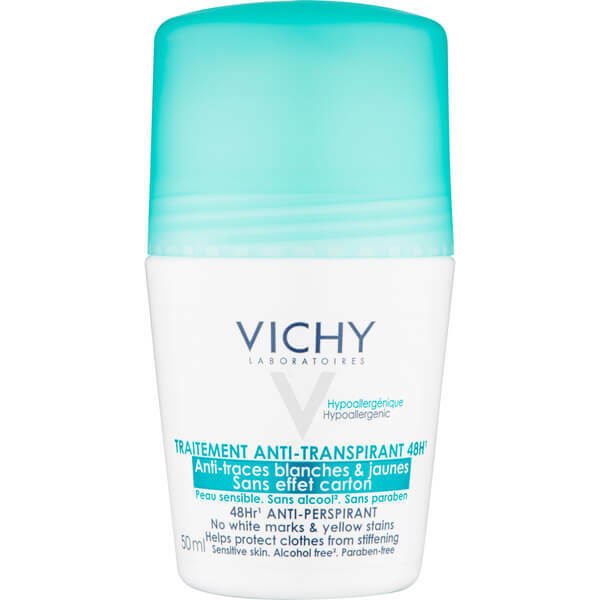 Discover intense protection with the Vichy Deodorant No Marks Roll-On; a 48hour anti-perspirant that provides effective protection, without staining clothing. Conveniently rolling over skin, the deodorant delivers long-lasting protection against perspiration, whilst neutralising odours for a clean and fresh feel all day. The roll on leaves underarms protected and refreshed, without producing white marks or yellow stains. Be confident all day. Suitable for sensitive skin. 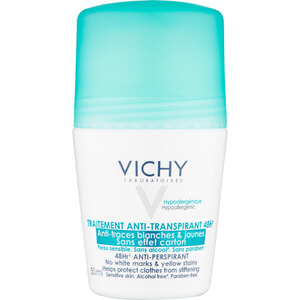 Free from alcohol and parabens. 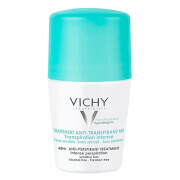 Roll the 48hr Anti-Perspirant on to the armpit area after cleansing. Aqua / Water,Aluminum Chlorohydrate,Dimethicone,C14-22 Alcohols,Steareth-100/PEG-136/HDI Copolymer,Parfum / Fragrance,Perlite,C12-20 Alkyl Glucoside,Tetrasodium Glutamate Diacetate,Iodopropynyl Butylcarbamate.